See PubMed and MEDLINE: How They Differ for additional information. ...to Sharon Leslie, Georgia State University Library, who kindly gave us permission to re-use her PubMed LibGuide. 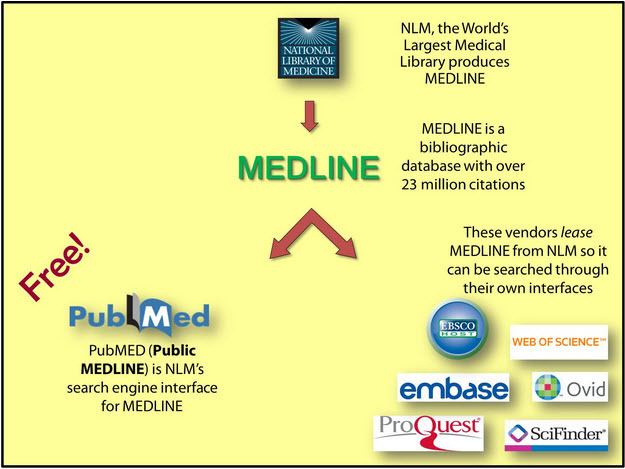 PubMed is NLM's search engine interface for MEDLINE, which is a database of citations and abstracts in the fields of medicine, nursing, dentistry, veterinary medicine, health care systems, and preclinical sciences. MEDLINE indexes approximately 5,400 biomedical journals published in the U.S. and worldwide. Coverage extends back to 1946 with over 23 million citations. OLDMEDLINE Article citations from international biomedical journals from 1946 through 1965. In-Process Citations Very current citations that have not yet been indexed with MeSH. PubMed is a free resource developed and maintained by the National Center for Biotechnology Information at the National Library of Medicine®.